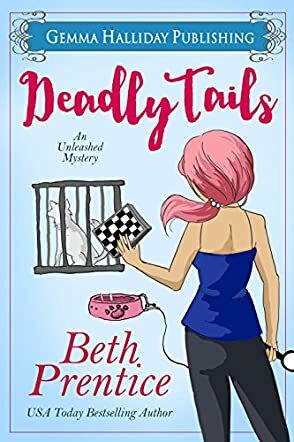 Deadly Tails by Beth Prentice is book two in The Unleashed Mysteries series. While Chloe McDermott is out delivering packages, an elderly friend, Jimmy, insists on giving her an old chess board as a gift. Not long after, Chloe's life seems to fall into chaos when her beloved dog, Theo, is abducted and the dognapper wants the board as ransom. The only problem is the chess board has gone missing. When she goes to get answers from Jimmy, she's shocked to learn that he has committed suicide. Accepting help from her boyfriend's father and her best friend, she discovers this is more than a dognapping case, it's a murder investigation. Chloe will stop at nothing until she can get Theo back, even if it means getting into the middle of a dangerous game. The danger remains fairly upbeat with humorous phone calls with the dognappers and the group's continuous failed attempts to rescue her dog. Beth Prentice balances the comedic elements with an emotional roller coaster, while striking the perfect blend of dangerous stakes and lighthearted romp. It's heartwarming how everyone rallies around Chloe in her search, coming to her aid without a second thought. The mystery is full of twists as the danger increases and surprises keep coming around every turn. Chloe teaming up with Lee and Isaac makes for a hilarious good time with bickering, car chases, and sleuthing. Delightful and charming, Deadly Tails is a clever and dangerous adventure that gets funnier and deadlier with every page. A fun read for any cozy mystery lover!